The news is so depressing these days—especially out of Jammu and Kashmir—that any talk of peace, syncretism and pluralism can feel fake—or at best, like, textbook romanticism. Social media and television hysteria wrenches open the communal divide on every imaginable issue. And the phrase ‘secularism’ has become corroded like never before. The right-wing uses it like an abuse with its twisted variant called ‘sickular’; liberals are aware that political manipulations and inconsistencies have diminished the authenticity of what the idea is meant to stand for. Yet, in these bleak, horribly argumentative times, I felt I finally found a living illustration of what genuine, uncorrupted secularism and diversity is all about. I was invited to participate in the 70th raising day celebrations of the Jammu and Kashmir Light Infantry (JAKLI) in Delhi. The colonel of the regiment is Lieutenant General Satish Dua, whom I know well as a fine and courageous officer from his time in the Kashmir valley. But it was the understanding of JAKLI as a metaphor for India—or what we want India to be—that really lifted the spirits. One of the youngest Army regiments, JAKLI is one of a kind. Raised formally in 1948, it drew from local citizen’s militias that had been formed as volunteer forces to resist the Pakistani raiders in 1947. Today, the regiment is officially 50 per cent Muslim and 50 per cent non-Muslim, and enormously proud of its multiplicity of faiths and cultures. At the celebrations, where I was moderating a discussion on what meaning the word Kashmiriyat had in today’s troubled times, I had an opportunity to speak to a maulvi of the regiment. His words made me feel Indian liberals should reconsider the word most often used to describe coexistence among communities—‘tolerance’. It indicates a grudging, if civil acceptance, of the other. But the cleric spoke of not just enduring different faiths, but actually participating in them. So, during Ramadan, he said, the senior officers of the unit keep fasts, irrespective of their faith. During Diwali, the Muslim soldiers stand in for duty so that the Hindu soldiers can get a few evenings off. And this year, during Baisakhi, because the granthi was on leave, a maulvi delivered the sermons of the Guru Granth Sahib. The most inspiring custom of the regiment is what the soldiers call MMG—Mandir, Masjid, Gurudwarara—which brings people from all religions and faiths to pray under the same roof. This encouraged intertwining of faiths—down to the cooking of food in the kitchens where halal and jhatka meat is prepared side by side—is a lesson for all secularists. For too long, Indian progressives have embraced the Nehruvian version of secularism—a polite, rational, and dry coexistence of communities. From the JAKLI we learnt that genuine pluralism is to actually take joy in each other’s beliefs and rituals. 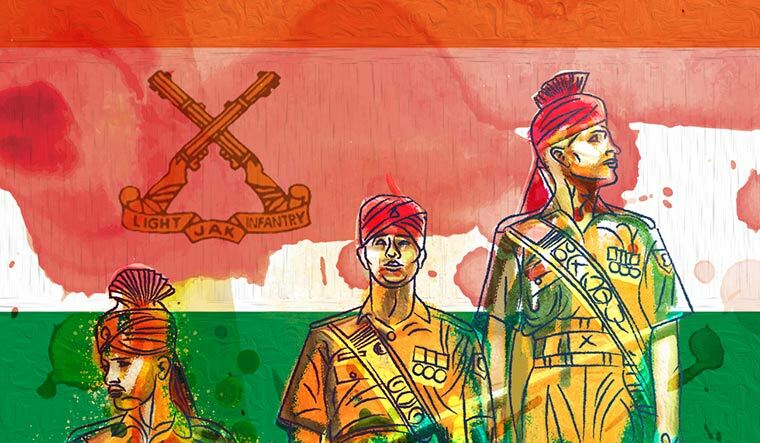 “After all, the only religion for a soldier is the uniform; he is aware that the bullet makes no other distinctions,” said Major Vijayant Bist, this year’s winner of the Kirti Chakra. By him stood Lance Naik Badher Hussain, who was decorated with the Shaurya Chakra. They were both in an operation together and would laugh at anyone who would even notice that they belong to different faiths. The Jammu and Kashmir Light Infantry is a microcosm of a Utopian India. We should learn from it.